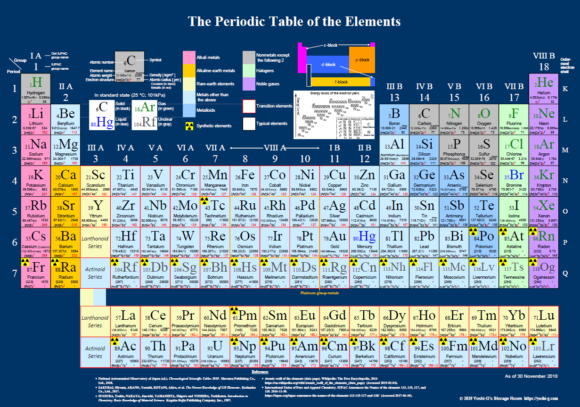 You can download the original periodic table of the elements for free. The table is updated on 6 February 2019! Nowadays, we can get many kinds of periodic tables of the elements online. However, I could not satisfied with them. So I made my original periodic table of the elements by myself which is, I believe, one of the most beautiful and academically valuable tables. You can download and use it for any purposes, following the notices below. The copyrights of the table and the file belongs to Yoshi-G, the webmaster of this website. Please refrain from modifying them. When you use the table for your article or literature, specify the copyright by the table/figure or in the references as “© 2019 Yoshi-G’s Storage Room – https://yoshi-g.com”. If you want to use the table for commercial purpose or ask any other questions, send an e-mail to .